Christmas wreaths are festive holiday decorations that are made from a variety of materials. 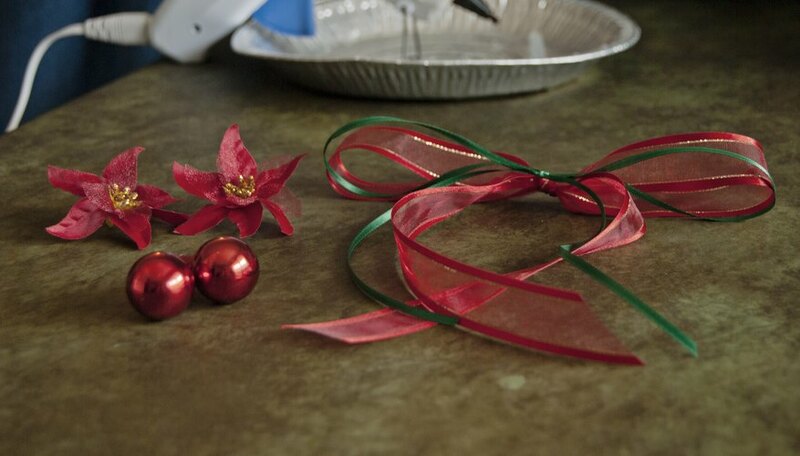 Supplies such as pine boughs, ribbons and even yarn are used to create holiday wreaths. 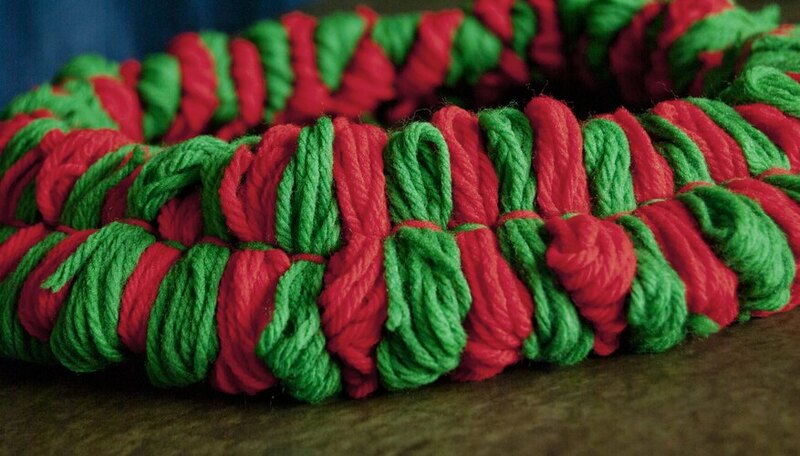 Christmas yarn wreaths are particularly easy to make and inexpensive to create. Yarn wreaths are a great gift to give to friends and a fun project to do with children. With a few simple materials, you can make a beautiful decoration for your home. 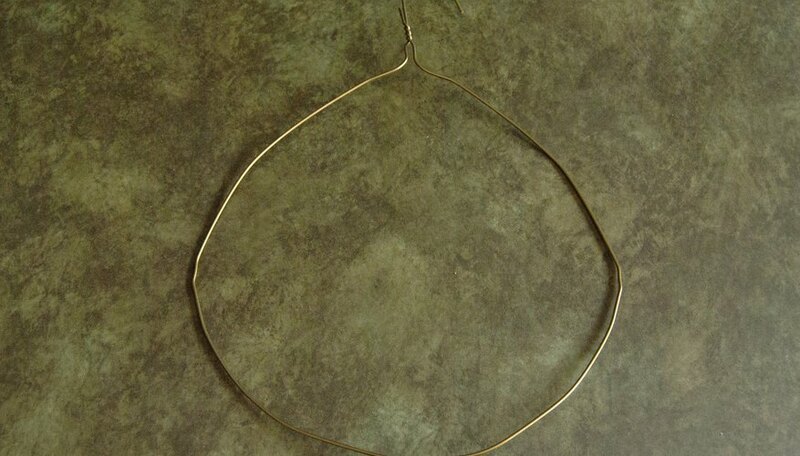 Bend a wire coat hanger into a round, circular shape with your hands. Gently bend and push the wire hanger hook back onto itself to form a closed loop shape to serve as a hanger for your wreath. Measure the yarn and cut 80 yarn pieces, each 5 inches long, and set aside. Wrap yarn from the skein around the 3-by-3 inch piece of cardboard 25 times. Hold the end of the skein with your thumb against the bottom front of the cardboard. Wrap the yarn over the top and bottom of your cardboard until you've completed 25 wraps. Gently slide the bundle of yarn off of the cardboard. Tie the yarn bundle. Take one 5-inch piece of yarn and lay it out on a flat work surface. Lay the 25-loop yarn bundle on top of the 5-inch strand. 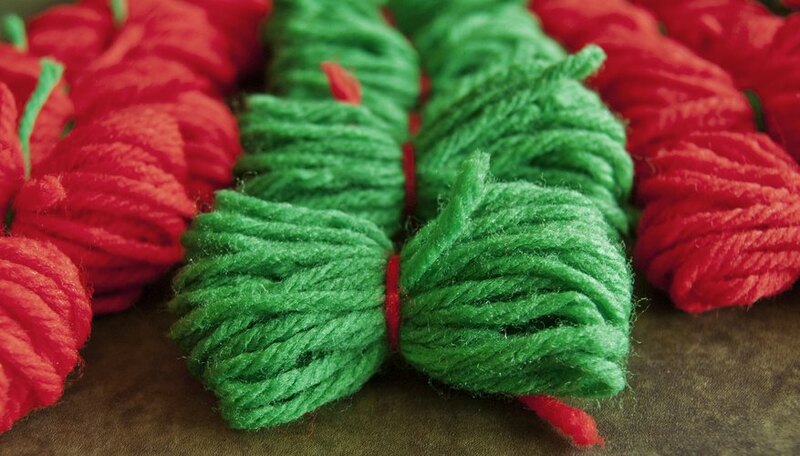 Take the left and right ends of the 5-insh strand and tie them in a knot around the top bundle to create your yarn wreath. Make 80 yarn bundles in total. Continue to make yarn bundles by wrapping the yarn from the skeins onto the 3-by-3-inch cardboard piece, sliding them off after reaching 25 revolutions around the cardboard, and tying them together with the 5-inch pieces of yarn to form 80 bundles. Set them aside as you make them. Tie a yarn bundle onto the hanger using the ends of the 5-inch strand that is holding the bundle together. Continue to tie yarn bundles around the hanger until it is completely filled and looks like a wreath. Add embellishments to your yarn wreath. After the wreath is filled with yarn bundles, use a hot glue gun to add accents such as Christmas balls, silk flowers, a large bow, candy canes or other holiday items to your wreath. Use one color of yarn or mix yarn colors in the wreath. Experiment with sparkle yarns and other specialty yarns. Keep the bundles positioned tightly together, so the wreath appears full. 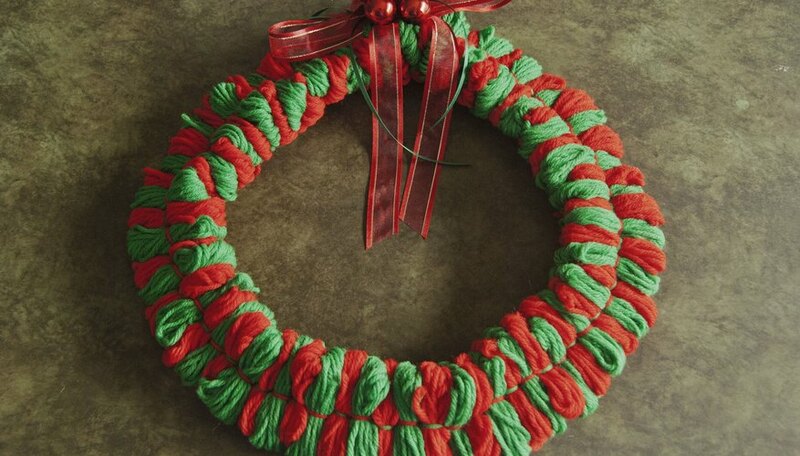 Attach yarn bundles to your wreath in a clockwise manner. The number of yarn bundles you need is determined by the type of yarn you use. Bulky yarns will fill in the wreath with fewer bundles than worsted or lighter yarns. Use caution when using a hot glue gun, as the glue can be extremely hot. Take care when you bend the wire hanger. The ends are sharp.